Some of the newspaper reports covering our 40 years in Enfield Town. 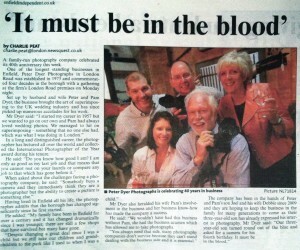 Coverage from Enfield’s local papers, reporters from The Enfield Independent and The advertiser. 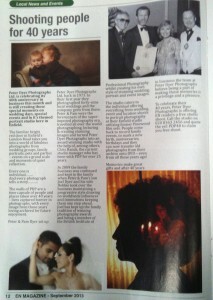 Along with Enfield Free magazine EN. 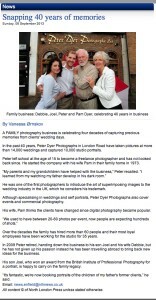 to cover of 40 years in business, one of Enfield and North London’s longest servicing photographic business. 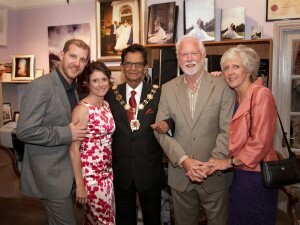 40 Years in business and we had the honour of welcoming the Lord Mayor of Enfield to help us celebrate. To mark the occasion and achievement of being one of Enfield Town’s long standing family businesses – friends, long standing clients,venue and event organisers plus our friends in the industry joined us for a few drinks here at our Enfield portrait studio. Peter and Joel both said a few words of thanks to all who have touched our lives and who we have had the pleasure of photographing – some of you could not make it but were in our thoughts. 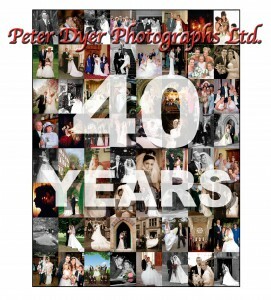 We’re looking forward to continuing the legacy………………………………………..
Peter Dyer Photographs Enfield – This week the company is 40 years old. Thank you to all our customers, suppliers and friends for their support over the years. 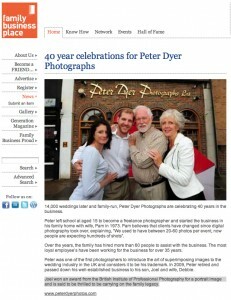 This is a video of but a few of the people we have photographer or been part of the business. Fun times with fun people.